Breast milk substitute. For combination & bottle-fed babies. Nutritionally complete and enriched with Omega 3 & 6 LCPs. Ready-to-feed and resealable on-the-go cartons. Suitable for Halal. 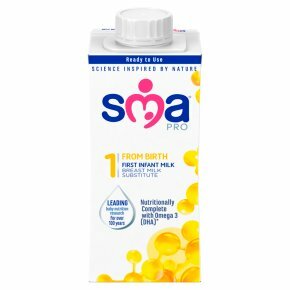 Stage 1, from birth Breast milk substitute Same formula, fresh new design Leading baby nutrition research for over 100 years SMA® PRO First Infant Milk, our best alternative to breast milk, when baby is not breastfed. Breastfeeding provides the best start for your baby, but if you decide to combination feed or bottle-feed then SMA® PRO First Infant Milk is a nutritionally complete breast milk substitute, enriched with Omega 3 & 6 LCPs. Ready-to-feed resealable liquids do not require any preparation. Just shake and pour them straight into a sterilised bottle. Available in 1 litre and 200 ml on-the-go resealable cartons. Starter pack also available containing 6 x SMA® PRO First Infant Milk 70 ml plastic bottles with 6 x NUK® pre-sterilised orthodontic teats. Also available in 800 g powder. Feeding guide birth - 12 months Approx. age of baby: Birth - 2 weeks; Approx. weight of baby: 3.4kg, 7 1/2lb; Size of Feed: 100ml, 3 1/2fl. oz. (approx. ); Feeds in 24 hours: 6 Approx. age of baby: 2 - 4 weeks; Approx. weight of baby: 3.7kg, 8lb; Size of Feed: 130ml, 4 1/2fl. oz. (approx. ); Feeds in 24 hours: 6 Approx. age of baby: 4 - 8 weeks; Approx. weight of baby: 4.2kg, 9 1/4lb; Size of Feed: 130ml, 4 1/2fl. oz. (approx. ); Feeds in 24 hours: 6 Approx. age of baby: 2 months; Approx. weight of baby: 5.3kg, 11 3/4lb; Size of Feed: 170ml, 6fl. oz. (approx. ); Feeds in 24 hours: 5 Approx. age of baby: 3 months; Approx. weight of baby: 6.1kg, 13 1/2lb; Size of Feed: 200ml, 7fl. oz. (approx. ); Feeds in 24 hours: 5 Approx. age of baby: 4 months; Approx. weight of baby: 6.7kg, 14 3/4lb; Size of Feed: 200ml, 7fl. oz. (approx. ); Feeds in 24 hours: 5 Approx. age of baby: 6 months; Approx. weight of baby: 7.6kg, 16 3/4lb; Size of Feed: 250ml, 8 1/2fl. oz. (approx. ); Feeds in 24 hours: 4 Approx. age of baby: 7 - 12 months; Approx. weight of baby: -kg, -lb; Size of Feed: 200ml, 7fl. oz. (approx. ); Feeds in 24 hours: 3 This table is a guide only; your baby may need more or less than the volumes stated. If you require more advice, consult your healthcare professional. Remember to feed your baby on demand. Preparing your baby's feed Failure to follow instructions on preparation and storage may make your baby ill. 1 Wash hands well. Wash and sterilise all utensils according to manufacturer's instructions. 2 If carton is damaged in any way, do not use. Shake carton well and unscrew cap. Pour desired amount into a sterilised bottle and add sterilised teat and cap. Replace plastic cap on carton. 3 SMA® PRO First Infant Milk can be fed at room temperature. If required to heat, stand filled bottle in warm water, do not immerse the teat. 4 Before feeding shake the bottle well. If warmed, test temperature by shaking a few drops onto the inside of your wrist- milk should be lukewarm. Important Feeding Information Check best before date. For hygienic reasons, discard unfinished feed in the bottle as soon as possible, and always within 1 hour. For older babies, ready to use formulae can be added to food. Do not alter or add to formulae unless medically directed. Do not warm feeds in microwave, hot spots may occur and cause scalding. Remember cows' milk should not be used as a drink during the first year. Important Notice<br>Breast milk is best for babies and breastfeeding should continue for as long as possible. Infant milks are suitable from birth when babies are not breastfed and should only be used on the advice of a doctor, midwife, health visitor, public health nurse, dietitian or pharmacist, or other professionals responsible for maternal and child care. When bottle-feeding, do not allow prolonged or frequent contact of milk feeds with teeth as this increases the risk of tooth decay. Ask your healthcare professional or dentist for advice. Always hold your baby while feeding. Do not leave your baby unattended as they might choke.